Comments From the Edge: Israeli Econcomic Links Behind the "Arab Curtain"
Many Israelis were surprised last week to discover that the American State Department had imposed sanctions on an Israeli company, the Ofer Brothers Group, for allegedly selling an oil tanker to an Iranian company. This contravenes the stringent sanctions that have been placed on Iran in response to the country's continued development of its nuclear program, sanctions which were strongly urged by the Israeli government. The Ofer Brothers Group is one of Israel's largest companies and owns Zim Shipping Lines, the world's 10th largest shipping company. 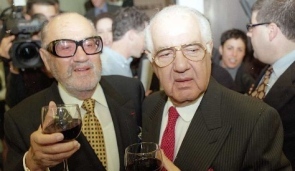 The Ofer brothers, Yuli and Sami, are amongst Israel's wealthiest individuals - Sami is listed in the 2011 Forbes billionaire list as Israel's richest man with a net worth of over $10 billion. The whole episode has served to focus the minds of Israelis regarding trade by Israeli companies behind the so-called "Arab Curtain". In recent months and years, Israel has implored the US and other countries around the world to cease trade with Iran, particularly the import of Iranian oil, in order to punish Iran for continuously ignoring calls to open up its nuclear program for inspection by the International Atomic Energy Agency under the auspices of the UN. These sanctions were recently implemented, and companies around the world are subject to severe penalties if they are found to be contravening the blockade placed on Iranian companies. This is particularly true of those found trading with companies that form part of the network of Iranian companies linked to the government. Nobody would ever have considered the necessity for Israeli companies to fall into line with these sanctions, as it was considered obvious that Israeli companies would not be trading with its arch-enemy, Iran. Iranian President Ahmadinejad never loses an opportunity to call for Israel's demise and destruction in public forums, and the Iranian government is sponsoring Hamas and Hezbollah, which are both engaged in ceaseless attacks on Israel. Although there are a number of countries that refuse to recognise Israel's right to exist, none can be regarded as an enemy in the same category as Iran. It seems inconceivable that Israeli companies would trade with Iranian counterparts, and it seemed an impossibility that Iranian companies would have any involvement with Israeli ones. And yet, it seems as though the Ofer Brothers Group may well have sold an oil tanker to an Iranian company (perhaps even one belonging to the Iranian government) via an Ofer Singaporean subsidiary. It turns out that Ofer ships may also have docked at Iranian ports on more than one occasion, indicating that they may have been involved in the transportation of Iranian oil. The Ofers have come out strongly denying that they were involved in any wrong-doing. They claim not to have broken any laws during the course of their business dealings. The USA clearly believes that the Ofer Brothers Group has violated the USA and UN blockade on Iran, and has imposed sanctions on their company. It is possible that the Ofer Brothers Group may also have broken Israeli law in the process. There is also a little-known law on the Israeli statute book which was enacted during the British Mandate in 1939. This prohibits Israeli companies from trading with enemy countries. There can be little doubt that Iran is an enemy country, and the Ofers may find themselves to be in violation of this law. This opens up something of a can of worms with regard to the activities of Israeli companies in Arab countries. Despite the fact that Israel does not have diplomatic relations with most countries behind the "Arab Curtain", the extent of Israeli trade with these countries would astonish many people. Finding Jaffa oranges in the gulf, or Israeli-developed software, security, telecommunications and water irrigation systems spread around the Arab world is already not a new phenomenon. Israelis have quietly been finding their way around Arab markets using sales people carrying foreign passports. There is a well-worn route via Jordan or Turkey which takes Israelis and their goods to countries in the Arabian Gulf, North Africa, Saudi Arabia and even Iran. In some cases, the recipients are aware of the source of their goods and choose to turn a blind eye, while in other cases the origin is somehow concealed. The question is whether these companies, some large and some small, should be prevented from undertaking their trade with "enemy countries"? Is this substantially different what the Ofer Brothers Group is accused of? Besides earning foreign currency from these exports, Israel has also benefited from trade activities behind the Arab Curtain by being able to gain access to important intelligence information. We will never really know the extent to which intelligence-gathering activities have been tied in with some of this trade. Somehow, I have the suspicion that it has been substantial. Interestingly, Wikileaks reveals that a secret cable from the US government in 2008 warned the Israeli government of steps taken by the US to enforce sanctions against Iran, particularly on Iranian shipping companies. It was almost as if the US government was aware at that stage of the activities of the Ofer Brothers Group, without mentioning the company's name. When the story first broke last week, a spokesman for the Ofer Brothers Group said that the company had received Israeli government approval for its ships to dock in Iran. Although the prime minister's office moved swiftly to deny this claim, I would not be shocked if the Ofer Brothers were somehow assisting Israel's network of intelligence-gathering in Iran through their activities. In short, Israelis apply double standards when it comes to trading with Arab countries, and with Iran in particular. On the one hand, they wish countries around the world to enforce an embargo on trading with these countries to try somehow to damage their economies. On the other hand, Israeli companies wish to continue to undertake their unofficial trade with these countries to boost their own economic positions. In some cases, this trade can extend to forming part of the Israeli intelligence network as well. We may never know whether the Ofer Brothers Group has been involved in trade of this sort or not. In the midst of huge headlines on this story and while I was writing this blog, it was announced that Sami Ofer died aged 89 of an illness that he suffered from for some time. He was laid to rest on Sunday, even while the storm engulfing his company continues. On the same day, the Knesset announced its intention to legislate the "Sami Ofer" bill. This will make it illegal in Israel to invest in a corporation that has business dealings with Iran. The punishment is proposed to be a year in prison and a fine of over $1m. We may never find out the true story behind the story of the Ofer Brothers, and their business dealings in Iran. It is a shame that this should be the legacy left by Sami Ofer on the day that he died, as this is really undeserved. The Ofer Brothers built a business empire in Israel from nothing, and have brought great distinction to the State of Israel through their shipping companies and other business activities. It is a real pity that, at the time of his demise, the headlines attached to Sami Ofer were so negative. May his family be comforted amongst the mourners of Zion and Jerusalem.